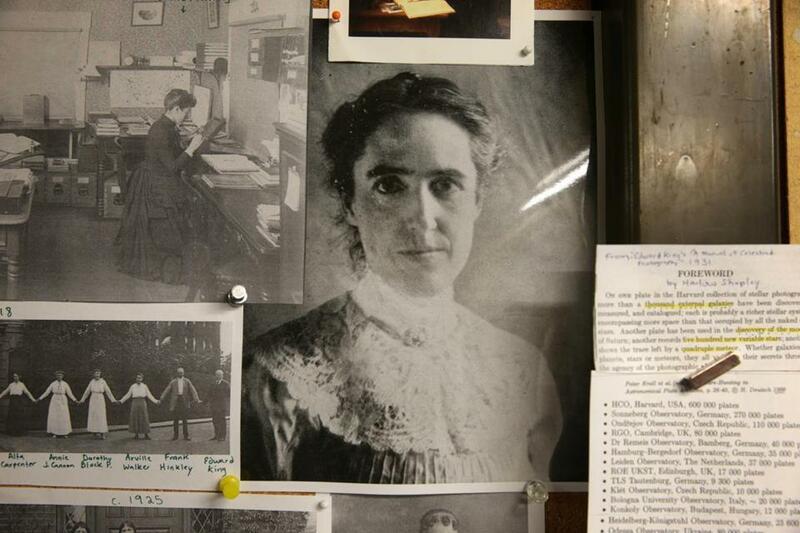 Photos of “women computers” Williamina Fleming (top left) and Henrietta Swan Leavitt. 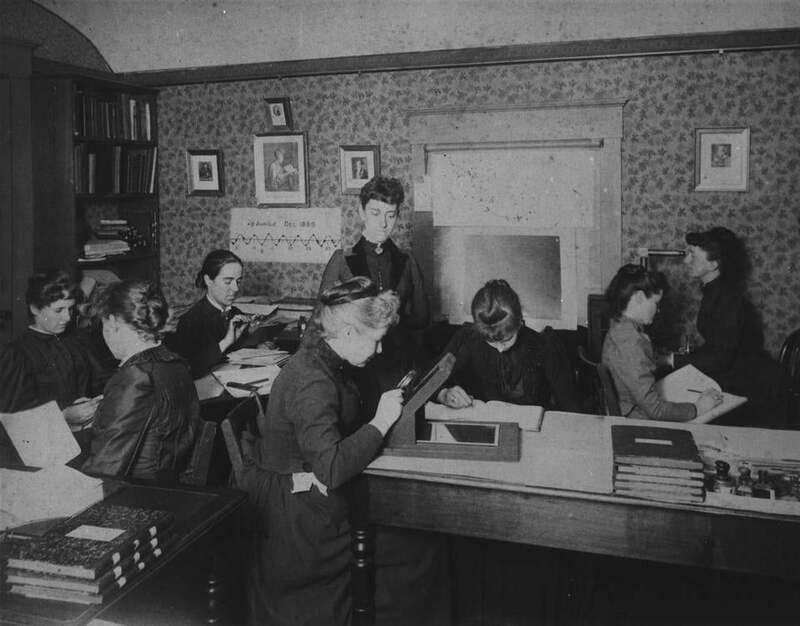 Between 1875 and 1927, more than 80 women were employed at the observatory as so-called “women computers,” that is, women who performed scientific and mathematical calculations by hand. For 25 to 30 cents an hour, their task was the meticulous study and care of black and white astronomical photographs of the night skies. In most images, the stars were tiny black dots on a white background. Day in and day out, the women explored the cosmos without looking through a telescope. It was painstaking work. Using a simple magnifying glass, they studied the stars, work that eventually led to discovering their composition. Staring at these stellar clusters, chemically captured on glass plates, helped them gauge immense distances in space and measure the brightness of stars. Like the African-American women of the US space program depicted in “Hidden Figures,” they remained behind the scenes, holding stars in their hands. 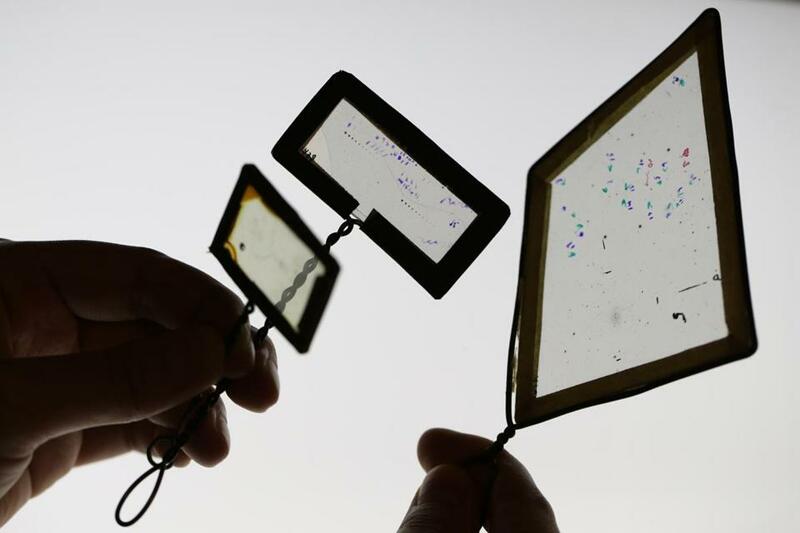 Glass plates helped “women computers” gauge immense distances in space and measure the brightness of stars. Inside the archive, center staffers have been digitizing the collection of more than 500,000 stellar glass plates. There are three floors of metal closets that contain stacks of these images, spanning more than a century of sky gazing. But in the past year, the curator also unearthed 118 boxes of notes from the women computers. Most of these boxes sat untouched in a depository for decades. Now, in partnership with the Smithsonian Transcription Center, volunteers around the world are transcribing scribbled logbooks and research notes from the women computers as quickly as they’re scanned and uploaded. The effort is called Project Phaedra, which stands for Preserving Harvard’s Early Data and Research in Astronomy. Phaedra is a character in Greek mythology. Her name was derived from the Greek word phaidros, which meant “bright,” said Daina Bouquin, head librarian at the John G. Wolbach Library in the Harvard-Smithsonian Center for Astrophysics. Photos of women computers at Harvard Smithsonian Center for Astrophysics. Newspaper articles from the time considered the women a novelty at best with headlines such as: “Brainy Boston Women Learn Sky’s Profoundest Secrets.” But Edward Pickering, the director of the Harvard College Observatory in the late 1800s, knew better. It was his mission to hire an entire corps of women computers to conduct scientific work. One of the earliest women computers, Annie Jump Cannon, kept detailed letters and scrapbooks of the time with prolific annotations. She classified hundreds of thousands of stars. And of that first generation of women, she was the only one allowed to use Harvard’s Great Refractor telescope. She discovered the Horsehead Nebula, a dark nebula in the constellation Orion, in 1888. Henrietta Swan Leavitt discovered how to measure stellar distances by focusing on variable stars (that is, stars whose brightness fluctuates) in the large and small Magellanic Clouds, two dwarf galaxies. She discovered about 2,400 of them, plotting how light from the same star changed over time. A 1934 glass galaxy count plate negative at Harvard Smithsonian Center for Astrophysics. 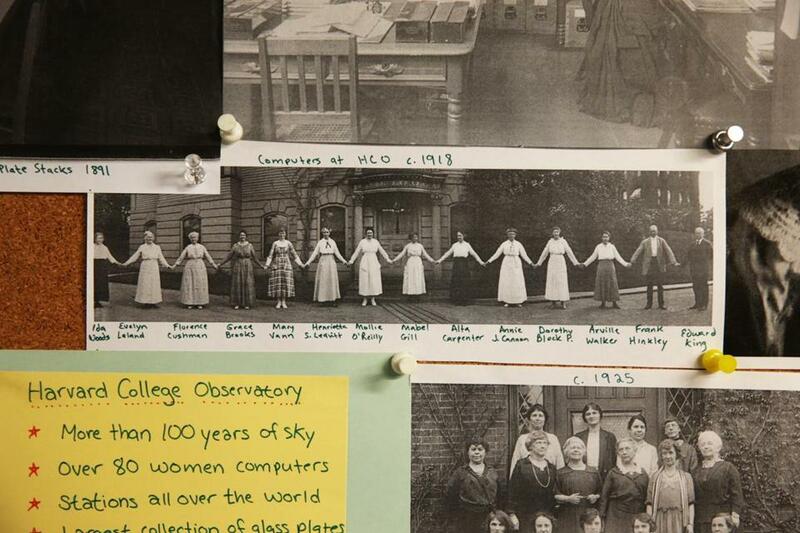 In photographs the women computers sit together in long dresses, posing for the cameras or holding hands outside the observatory where many of them spent much of their lives. Fleming was known to get weekly massages for the shoulder pain she developed from leaning over the glass plates for hours at a time. In 1900, she wrote about it in a diary she kept that ended up in a time capsule that was buried to mark the century. In her diary, she also complained about her pay and wrote of her responsibilities as a single mother. Somewhere along the line, the women computers’ notes on glass plates, logbooks, and achievements disappeared into obscurity. A group of women computers, directed by Williamina Fleming, back center standing.